So I went to visit my spinsta sista Romina on Cortes Island. With one knee swollen from hitting a curb and taking a flying header off my bike, and a heart bruised from over-exertion (from such loving, from loving so hard). Borrowed a rusty bike and went for a ride. Heard there was some Buddhist kind of place down the road, so headed that way. Downhill, then up, then down, and up again. Soon along the gears seized and the knee began to throb so I abandoned the bike, leaning it up beside a sign like a wheel, and began walking. My body started to buzz and tingle, and then I saw the sign, the red sign with no words, only a golden stupa painted on it. Followed the signs. An odd wind was blowing, a warm pulling wind, drawing me forward. 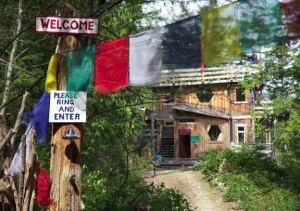 I passed under the prayer flags and rang the bell. 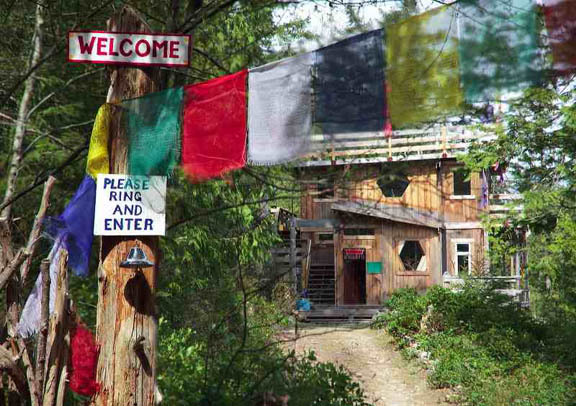 And so starting in June I will be living at Dorje Ling, also called the Babbling Buddha guest house and dharma center…keeping an eye on the place, helping to organize retreats (or at least one retreat, over my birthday weekend on July 4), convene work parties, garden and clean. Most of the time I will be alone there, just me and the wolves and the treefrogs and the owls.